We clambered aboard the boat at 10.30am for a refreshing blast back to Mersing along with another group of Europeans with sun-baked skins the colour of coffee beans. Delayed only by the purchase of some lemang (sticky rice and coconut milk cooked in bamboo lined with banana leaves) from a road side stall and a hideous queue at the Malaysian border, we arrived at the house in Singapore in time for lunch. Mrs M filled the afternoon with an unscheduled trip to the Sky Sands Park. As we stepped out of the lift onto the observation deck the rain began to fall forcing us to seek refuge with a few other tourists, a film crew and a number of pencil-thin models in slinky outfits and very large shoes. The storm blew over in about half an hour allowing our guests to take a few photos under the cloudy skies. 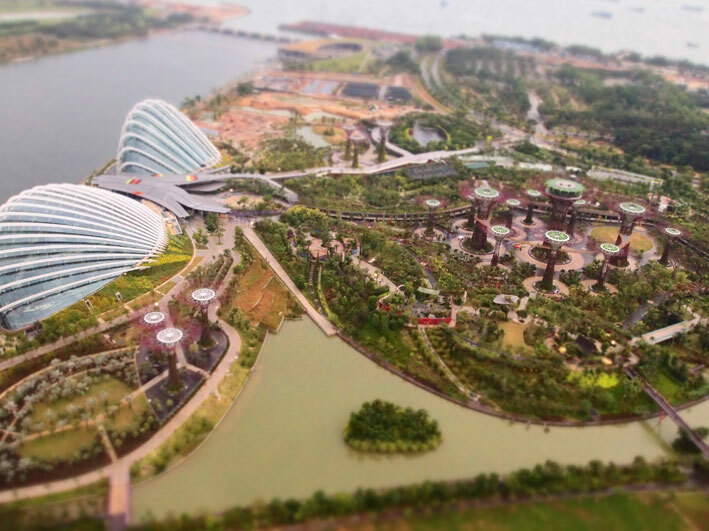 The strange lighting caused the new ‘Gardens by the Bay’ below to take on a model-like appearance, which was emphasised by photos taken using the diorama setting on the camera. Back at ground level, Tracy and Dave declined the offer to ride on the Sampans in the mall so we could get to Samy’s in Dempsey Village for a rousing curry. Unfortunately, Mrs M had forgotten that Samy’s was closed on Tuesday. Although we sat cross-legged in the Chang Korean Barbecue, nothing appealed so we adjourned to Muthu’s Curry which, apart from the atmosphere, was every bit as good as Samy’s.